PVC folding door is an ideal choice if you desire to produce a sense of space and openness in your house and partition between rooms because of its flexibility in occupying small or large opening. It’s also made of PVC material so you can get all the benefits it comes along like not rusting, rotting, changing or fading and it’s also fire resistant. You will also don’t need to repaint or varnished it to make it look new cause all you need to do is occasionally clean it to keep it looking brand new. This PVC folding door looks also fantastic for home interior design with loads of different colors that can imitate a real wood appearance. Like our client in B.F. Homes, Parañaque who opted for PVC folding door with Pine color to make look more like a real wood. As mentioned before, it very flexible in size, giving you a better opportunity in covering larger openings and letting you to open up a whole area of your home just what our client needed in their house. PVC folding doors can be very attractive, stylish and smart choice if you consider saving spaces in your place in a very affordable price. 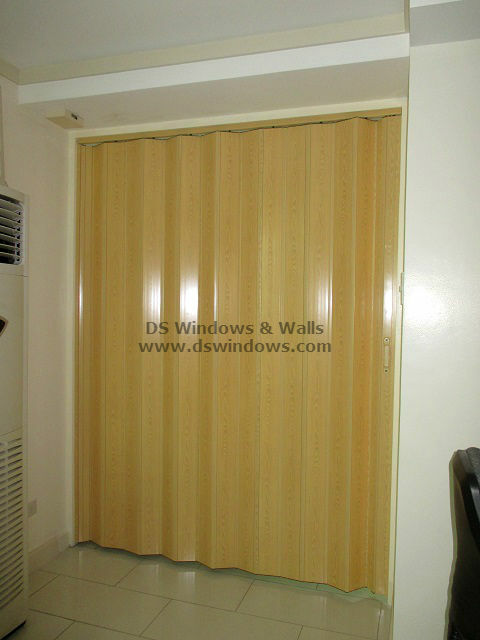 In DS Windows & Walls we offer different PVC Folding Doors with lots of options in design and color. 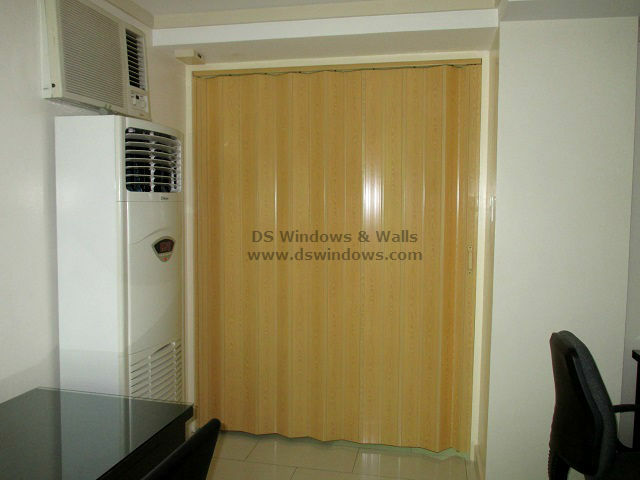 Our PVC accordion doors also vary in thickness. We also have French type that has glass for a more chic look and deluxe and regular folding door that has a lot of different colors that can look like genuine wood. For more inquiry please email us at inquiry@dswindows.com or call us at (02) 403-3262, (02) 668-9668, (02)893-1373 and 0916-311-3909. You can also visit our shop located at 4th level Waltermart Makati, 3rd level Robinson Metro East Pasig City and 2nd level Pacific Mall Lucena City.